Pastel Outfits for Men- Pastels are essential when you’re trying to freshen up your wardrobe with more lively shades. If you’ll look deeply into men’s fashion trends, you’ll realize that pastels are being utilized somehow; either it is Milan Fashion Week or London Fashion Week; either it’s Spring collection or Fall collection. 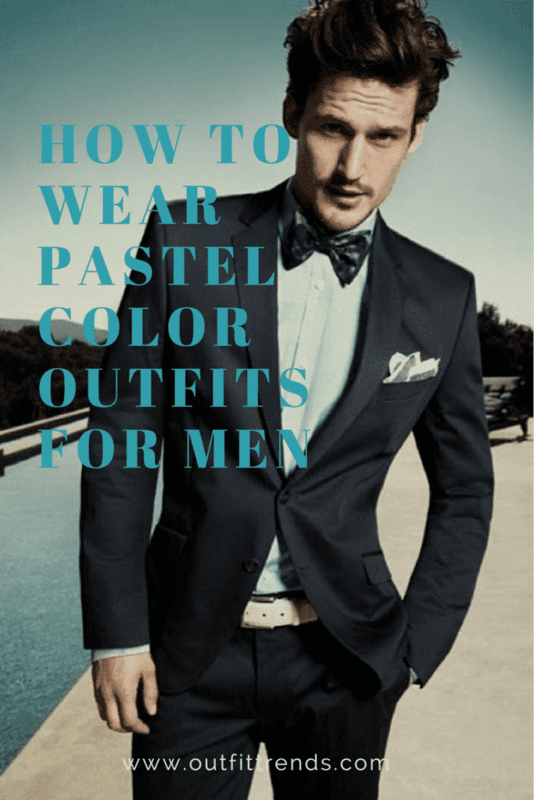 Regardless of the time of the year, every man has to know how to wear pastel shades particularly because it actually gets a bit tricky at times to play with pastel colors. If you’re conscious about your fashion statement, then you can definitely wear pastels quite easily. Creating an ensemble with pastels can go from quite safe and simple to extremely bold and charming. For those who still don’t find themselves comfortable around multiple shades and those who want to learn about new styling tricks with pastel can go through this guide. Here are 23 super cool ideas for men who like to dress fashionably and keep their style statement classy. Beginners should always try pastel with a solid neutral shade; more like black, charcoal, navy or skin. The neutral shade will accentuate the charming pastel shade. Also, you have to be extremely careful with your accessories i.e. hats, ties, socks etc; because most of the times accessories look good only if they are of the similar pastel color as that of the shirt. Have a look at 15 Ways to Wear White Button-Down Shirts for Men. You have to be a bit more conscious when layering pastel colors as it gets tricky to carry this much attractive combo. Always go for various frequencies of amethyst and beach blue. Always cut down the color with some neutral shoes or a jacket. Pastel suits look really cool at work but you have to be careful regarding when and where to add the shade. If your job requires you to be a bit too formal and wear more of neutral tones then you can add pastel to your inner shirt or tie only. However, if you belong to the art and designing department, then you can go for pastel color blazers or pants as well. Here are 30 Amazing Men’s Suits Combinations to Get Sharp Look. You have to be vigilant when picking shoes with your pastel outfit; oxfords in colors like charcoal and black will go with nearly all pastel shades. Try to match your shoes with the color of pants to be on the safe side. However, if you are a fan of bold ensembles, then you can also coordinate your shoes with the brighter frequency of the pastel shade or a completely contrasting neon color. People belonging to Indian and African descent, when trying pastel tones, are often advised to go for colors like lavender, bronze and brown sugar with different variations of maroon or navy. Earthy tones and peachy pink shades are not the colors which complement dark skin tone, however, it’s not a hard and fast rule. You can always go against such rules if you are confident enough to carry it well. Do check out these 30 Casual Outfits Ideas For Black Men. ↓18- How to Wear Pastels with Saturated Tones? Pastels go really well with their saturated tones, like a sky blue blazer with ink blue pants. However, you can also create a contrasting color scheme as in pairing a faded pink shirt with bronze jeans. Hard pastels are relatively less intense which makes them appropriate for wearing with softer pastels. You can also wear a hard pastel suit with a neutral color inner shirt as these shades are relatively subtle. Don’t miss out these 25 Ideas How to Wear Funky Colorful Socks for Men. You can create a charming vintage look by wearing a soft chalky blazer with a white button-down shirt and white cotton slacks. A vintage hairstyle and shoes will further enhance the look. Soft colored cargo shorts or pants look exquisite on the beach, especially colors like aqua green, asparagus or mist with contrasting neon color casual shirts and shoes like sneakers. You can also wear a simple tee with a button down shirt over it but the upper shirt has to be in a chalky tone. Here are 20 Amazing Beach Outfits Men. Guys who have a relatively paler skin tone can totally slay the earthy tones and the cherry blossom shade. They can go for blushy pinks as well as beach blues; contrasting them with white and beige pants will further spice up the ensemble. Pastel leather jackets are always recommended if going for a casual cool look as these are just perfect for creating a rugged and soft look simultaneously. Pair them up with pastel color shoes but make sure that the rest of your attire is in a neutral shade. You can also go for simple patterns like stripes and simple polka dots for the inner shirt. Here’s an exclusive guide on How to Wear Bomber Jacket for Men. If you’re looking for a pastel attire for some formal party then go for mint green or pastel peach inner shirt with a classy tie in the similar tone, however, if the party requires a casual attire then a pastel color blazer with pastel pants will also work. ↓11- How to Have a Pastel Look for Fall? All you need is a pastel hoodie, jacket, sweatshirt or a pastel sweater to create a perfect fall look with chalky colors. Add some sassy pants in a straight cut to complete the statement. Here are the 15 Best Colours to Wear in Fall for Men. Printed pastel shirts and patterned pastel blazers look best in spring when worn with black or skin pants along with plain white sneakers. Don’t add further accessories when trying pastel prints as it would be considered overdone. Pastel colors are being quite eminent in the athleisure part of men’s wardrobe; the minty and rosy shades are highlighting the athleisure collections. Enhance your pastel graphical sweatshirts with plain white sneakers. Here are 20 Athletic Gym-wear Ideas for Men. Spring is perfect for spreading a few lively shades in your wardrobe; colors like pastel lemon, mint green, baby pink and pastel plum are most loved spring chalky colors. Men can go for jackets and tees in the respective shades. Casual cargo pants can be paired with sneakers and a plain pastel sweatshirt to have a simple casual look. Here are 17 Ways to Wear Cargo Pants. Pastel colored denim jackets and pants have always been designers heart favorite but you need to have that sassy confidence to carry them. Big guys can look super cool by pairing pastel blazers with darker color neutral pants. Hard pastels are the best shades for big men. Have a look at these 20 Ideas What to Wear for a Road Trip. High-schoolers look exquisite in pastel colors as these are not too bright but still charming. Particularly, summers are perfect to slay some pastel tees with pastel caps. Grooms and even wedding guests can add chalky colors to their tux in different ways, like a chalky color shirt with a dark black blazer and pants or a chalky suit with a white or beige inner shirt. Here’s the perfect Semi Formal Wedding Attire For Men. Floral pastel shirts with dark bright colored pants are the funkiest for the spring’s lively climate. Here are 25 Ways to Wear Guys Floral Shirts. Asians guys can wear colors like peachy pink, rose, mint, sea green and lavender with black or charcoal pants and classy spectacles to have a cool summer/spring look. Share your unique pastel looks with us in the comments section.